Hummus is getting more and more popular as a healthy snack. It’s the quintessential partner of pita bread making the snack filling, so cravings for sweets can be diverted (you might even become obsessed with hummus instead). I prefer to have it on my sandwich instead of mayonnaise, if I’m to be quite honest. It’s easy to make at home, you need only a food processor to help you along the way. And what better way to celebrate Halloween than with a pumpkin-inspired treat? It can help with weight management. Rich in protein, which helps alleviate snack cravings and balance blood sugar levels. Its iron content can also give you an extra boost of energy. While you can get the same amount of fibre from eating whole grains like wheat and cereals daily, chickpeas have less fat which lowers cholesterol levels. Hummus comes with a whole variety of flavors from the different ingredients that can be used to make it. Take this pumpkin hummus recipe for example. Just google “hummus recipe” and you will have thousands of results at your fingertips. It may help in reducing cancer risk. Folate-rich food can help promote the growth of healthy bacteria in the colon, therefore lowering the risk of colon cancer and acts as a protective barrier to cancer. It’s part of the Mediterranean diet. The Mediterranean diet is apparently good for you, since it promotes eating primarily plant-based food such as fruits and vegetables, legumes, whole grains, and nuts. It replaces butter with healthy fats like olive oil and canola oil and uses herbs and spices instead of salt to add flavor to a meal. Cut off the top of the pumpkin about two-thirds of the way up. Remove the pumpkin seeds, then scoop the flesh of the bottom and the lid. Heat oven to 200C/180C fan/gas. Cut the pumpkin flesh into pieces and put in a roasting tin with the garlic and good portion of oil. Season and then bake for 45 minutes until very tender. Leave to cool. Tip the pumpkin into a food processor with any juices from the roasting tin and garlic. Add lemon juice, tahini paste and chickpeas. Season with salt and blend to a paste, adding a dash of oil it the consistency is too thick. 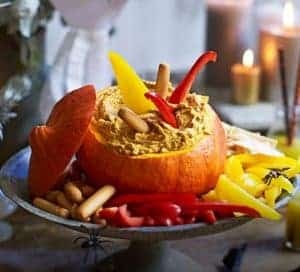 Scoop the hummus back into the pumpkin and serve with the peppers, breadsticks, celery sticks, and pita chips. You can also make this year-round with butternut squash or blue-skinned pumpkin! Enjoy!